The history of developing the Russian Arctic contains many mysteries and forgotten names. 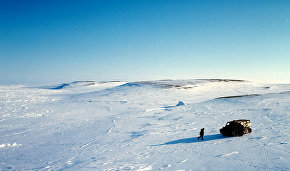 Members of the Great Northern Route expedition searched for traces left by Russian researchers and explorers on Russia’s northern coast. Expedition chief Vladimir Chukov, President of the Russian Geographical Society’s Arktika (Arctic) Expedition Center, discusses the expedition’s finds, the state of Arctic exploration memorials, and life above the Arctic Circle. Why is the expedition called the Great Northern Route? What is the idea behind it? We called the expedition the Great Northern Route because it is dedicated to our ancestors, the famous Russian polar explorers who lived during the reign of Tsar Peter the Great. Our expedition routes always have a historical aspect because it is not interesting to travel just for the sake of traveling. We need to know the historical background, the routes of explorers, the history of discovering these territories and the timeline of events. This is one such expedition. In 2015, we found some places in northeastern Taimyr, in Simsa Bay and on Severny Faddey Island, part of the Faddey Islands archipelago, where traces of a high-seas expedition were discovered in 1940. These Russian seafarers who lived in the Mangazeya era in the early and mid-17th century were travelling from the west to the east. Their commercial expedition involved the delivery of various goods, including beads and cloth. Members of that expedition perished, and an assessment of their surviving cargo indicates that the expedition may have involved several sturdy Koch-type boats adapted to Arctic navigation. You see, that boat contained too many navigational instruments for one vessel. What's most interesting is that we found a large treasure trove consisting of about 3,500 coins minted between the late 15th century and the early 17th century. Numismatists have studied the trove and established that all these coins were minted not later than 1614-1616. Therefore we know the precise date when these seafarers who were either members of the Pomor ethnic group or merchants from Veliky Novgorod set out on their voyage. Today, it is impossible to say how many navigation seasons they had spent in the region, and whether they had spent one or two winters there. But this voyage began long before the Great Northern Expedition (Editor's Note: The Great Northern Expedition denotes a number of Russian exploratory missions along Siberia's Arctic coast towards the shores of North America and Japan in the second quarter of the 18th century on orders from Peter the Great), as well as long before the expeditions led by Otto Nordenskjöld and other explorers, who reportedly became the first men to round Taimyr and what is now Cape Chelyuskin. It turns out that our ancestors sailed via the Great Northern Route, now called the Northern Sea Route. This is very important and topical because we are now using every argument to prove that we are masters of the Arctic. And this astonishing fact has been overlooked for quite a while. We sailed the Arctic God knows when, and the bones of our ancestors lie there. We have every right to celebrate the Northern Sea Route's 400th anniversary in 2016. And we have decided to dedicate our expedition to this date. Our fellow historians claim that there must be some other traces of that expedition elsewhere because, speaking logically, they were shipwrecked, spent the winter ashore and tried to make another boat whose fragments were also found. This voyage may have continued… Of course, April is not the best time for conducting a search, but we, nevertheless, traveled along the expedition's supposed route. We rounded Taimyr and crossed the Byrranga mountain range, the northernmost mountain range in the world, and visited some interesting places. They told us the coordinates of islands in the mouth of the Nizhnyaya Taimyra River where someone spotted very old fragments sticking out from the ground. We have visited that truly interesting place. We should go there in summer to see whether this is a surviving camp of the Great Northern Expedition or whether these fragments date to some older period. We are unable to act as professional archeologists because our task is to popularize science. But we hope to interest historians in this subject, so that it would become possible to organize a real archeological expedition to these islands and continue the research. I believe we are wrong not to pay due attention to this today. What route did you take? 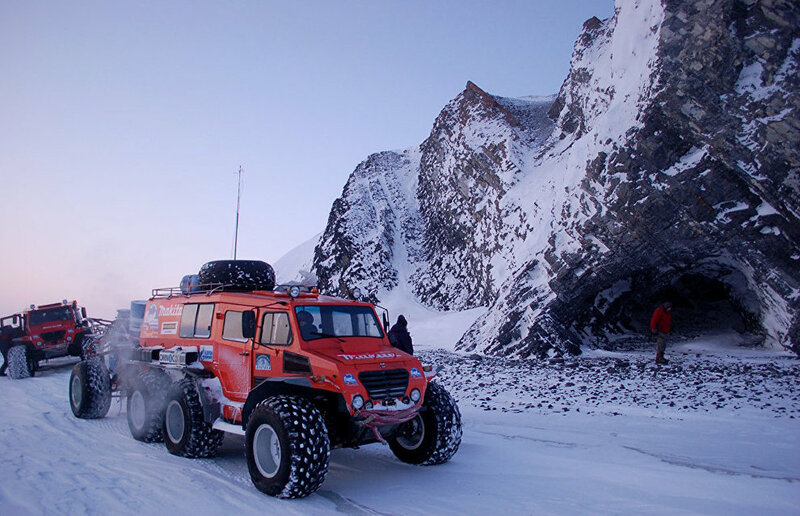 Members of the expedition set out from the city of Novy Urengoi in March. We have already conducted many expeditions from that city whose administrators know us very well. The hospitable hosts are extremely interested in our projects, they help us prepare our all-terrain vehicles and other equipment for the expeditions. A small dormitory is also located at the base; we find this very convenient, and we are ready to push off in several days. We traveled along the entire Arctic Ocean coast from Yamal to Chukotka and reached Pevek two months later. During your trip, you visited many places linked with the exploration and development of the Russian Arctic. What is the current state of Arctic exploration memorials? In 2015, we visited Cape Chelyuskin, only to find that a cairn, a stone pyramid, built by Roald Amundsen in honor of Nordenskjöld's voyage, had been wrecked. A column honoring Russian explorer Semyon Chelyuskin with a cast-iron plaque saying "This Cape was discovered by…" is also nowhere to be seen. A wartime cannon is still there… We should not blame anyone for this damage. The thing is that fast shore ice no longer accumulates along the local coast, and this leads to perfect "Arctic storms" when the wind drives ice-floes ashore, and the ice pulverizes everything. Of course, we have to restore the monuments because otherwise there would be nothing left. There are many enthusiasts, including young people, who should go there when the time is right, and we must help them and tell them exactly what to do. We have numerous photos. Three local border guards have built a stone mound in place of the wrecked cairn, but of course, it is a far cry from that stone pyramid which needs to be restored. Once upon a time, there lived a real enthusiast, a hydrologist named Vladlen Troitsky who ranked among the best amateur historians ever. He found a place where a cairn honoring the 1900 expedition of Baron Eduard Toll aboard the ship Zarya once stood. In the 1970s, Mr. Troitsky used photos to locate that place and restored the stone pyramid which is standing to this day. As I see it, we need to look after all these monuments that have been catalogued and photographed many times. And now we are losing them. This year, we visited Middendorf Cave while rounding Taimyr. The local landscape is very beautiful, and that cave really impressed us. In 1842, explorer Alexander Middendorf fell ill during an expedition, and his companions left him inside the cave, promising to return. He spent a month there with scarce food supplies and survived. They picked him up, and the story had a happy ending. All history books refer to this cave as a place where this famous Arctic explorer had a very harrowing experience. He had virtually no chances of surviving, but somehow he did cling to life. He displayed remarkable stamina. Last year, enthusiasts from Krasnoyarsk brought a granite slab with Middendorf's image and short biography here. Enthusiasts have built a wonderful museum in Dudinka. The three-storey building has great interiors, heating and air conditioning, and security systems good enough to display exhibits even from the Tretyakov Gallery or any other famous museums. The Dudinka museum has a rather interesting and modern collection but virtually lacks any truly historical artifacts, like those at the Arctic and Antarctic Museum. They are happy to display any authentic document. We provided them with sleds and clothing that we sewed for our first independent skiing expeditions of the 1980s. Mr. and Mrs. Lubnin, two retired geologists, established another museum in Dikson, north of Dudinka. After retiring, they did not want to return to mainland Russia and conducted their amateur archeological expeditions around Dikson each spring, when the snow melted in the tundra, for the rest of their lives. This professional husband-and-wife team combed the Great Northern Expedition's winter camps and found many interesting artifacts. Later, they established a museum on the main floor of a local building that was allotted them. They conducted research and measured various parameters the way scientists do. After they passed away, all these exhibits vanished into thin air. Their artifacts included some items from the Nordenskjöld Islands archipelago and fragments of Vladimir Rusanov's ship Hercules from Popov-Chukhchin Island. No one was able to tell us where all this disappeared. This is rather vexing because this attitude will cause us to lose all available artifacts and other relics. Members of your expedition also monitored the Arctic coast's environment. Could you say a few words about its current state? Instead of monitoring various parameters, we simply looked around and recorded our findings. Everything is good in pristine areas where no one lives. Even some remaining structures do not damage the environment in any way. Of course, all this is ugly looking, especially when the snow melts. For their part, oil workers have been instructed to clean up after themselves. When a winter camp shuts down, several trucks drive along a muddy road, and workers collect cable fragments, tires and all other trash. This land reclamation effort, which does not accomplish everything, does yield some practical results. As a rule, polar station crews are in no mood to pick up after themselves. Although there is no chemical waste at polar stations, their personnel still have to collect and remove a lot of trash. Geologists often use various chemicals for drilling wells, and they do not always gather up bags filled with chemicals after completing all the work. These are small amounts of chemicals, but they damage the environment. It is possible to collect and remove this trash, but people probably consider such work to be unnecessary. You met with local residents during the expedition. What did you tell them? And what issues interested them most of all? We had many interesting meetings. When we were younger, we wanted to be more independent, even if it was not justified sometimes. We deliberately bypassed various communities during our expeditions. And now we like to talk to the locals. When we see a wigwam, we know there must be people inside, so we go there and get acquainted. Everyone wants to know what's going on all over the world. Nomadic ethnic groups and polar workers are modern people living in austere conditions reminiscent of the 1937-1938 North Pole 1 expedition headed by Ivan Papanin. Indeed, they live too far away from civilization. Local polar stations were mostly built in the 1950s and the 1960s. Capable polar station managers keep everything in good order. It's warm and dry inside station modules, everything is available, all systems, including diesel engines and generators, are working fine, and the station has enough electricity. But incompetent managers mean trouble. In such cases, people feel neglected, everything is in a poor state, everyone is complaining and airing grievances and expecting something from others… Of course, there is not enough funding, and station personnel are underpaid. But the real reason seems different. When you pass through various towns, you can see that their people know how to earn a living with fishing, raising reindeer and other economic activities. They are not begging anyone for alms and handouts. Capable managers who know how to address various issues and help everyone have made it possible to establish numerous thriving towns. A young woman about 30 years old, the chief administrator in the town of Rybnoye, was elected to her current position. She manages the infrastructure, and everyone asks her for advice. We were really happy to see this. Everything depends on the people. It may be surprising, but teachers treat children with love there. Few teachers at our schools in mainland Russia can talk sincerely to their students, and there is no love at our schools. How can you deal with children if you don't have the required aptitudes? Can you teach them arithmetic? It's unlikely because they know arithmetic almost as well as you do. And it is possible to teach children how to interact with people only if you have no problems in this respect. Take Khatanga, for example. They invited me to attend an open volleyball championship there. I used to play volleyball in my younger days, and I'm a master of sports. They have six women's and five men's teams, not to mention children's teams there. I could not believe my eyes. Khatanga residents played their own open championship for three days. Of course, we talked to people there and met with local school students. They asked us to deliver a talk at the Pevek museum and to take part in a contest dedicated to polar explorers. The locals, especially children, care a lot about newcomers. They listen to you with tremendous and genuine interest. I suggested that they watch documentaries on our four-month expedition to Canada. (Editor's Note: In 1998, a team of the Arctic Expedition Center traveled from Russia to Canada via the North Pole). Adults and children alike were really impressed after watching the documentaries. We felt quite happy. And the same can be said about all other towns. What was the most interesting aspect of this expedition? The people proved to be the most interesting aspect. We travel all over the Extreme North every year, and it is hard to surprise us with any new location, although we choose places where no one has gone before. But their list is dwindling steadily. And when you meet with people and talk to them, you realize how amazing they are. Something in them allows them to speak confidently about the future, while living in difficult conditions. We heard some defeatist statements five to six years ago, while now the situation is improving little by little. I want very much to believe that the Russian North will experience more and more positive changes. I'm an optimist, and I'm confident that the Arctic will witness some major changes over the next ten to 15 years.